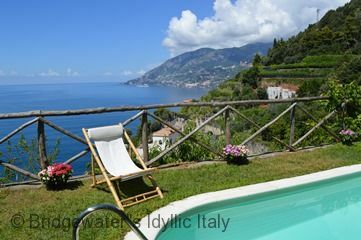 Villa La Maceraia offers a rare combination of extensive view of the sea and of the coastline, private swimming pool, spacious terraces, well appointed interiors, private parking, privacy and peacefulness. 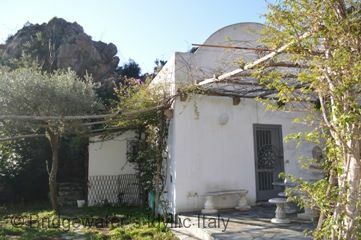 The house is on the top of a rocky outcropping near a summit that overlooks the sea and is surrounded by sloping land divided into different sized terraces linked to each other by stairs and paths. 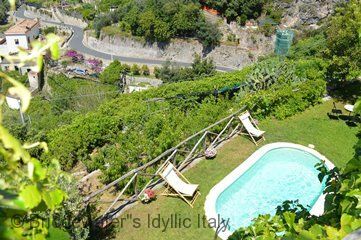 The terraces are covered in verdant cultivations of parfumed lemon trees and green Mediterranean scrub in a unique habitat. 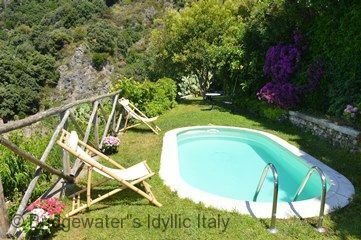 Set in a secluded spot, it is a peaceful oasis to return to after a day's sightseeing in Amalfi, Ravello, Positano, Sorrento, Pompeii, Paestum and others. 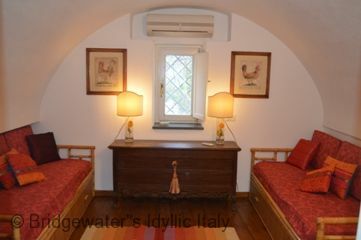 This accommodation is an old stone building of about 60 square metrEs, suitable for a couple or a small family. 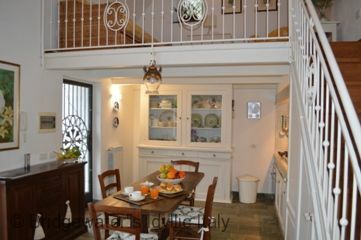 The interior is perfectly decorate; warm and inviting. 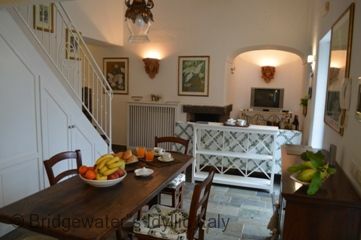 It has been recently restored and furnished with a mix of country style, some antique pieces, very comfortable furniture and stone floors. 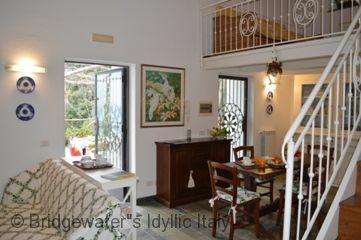 The swimming pool is 3x2 metres and is to be found on a terrace below the villa. 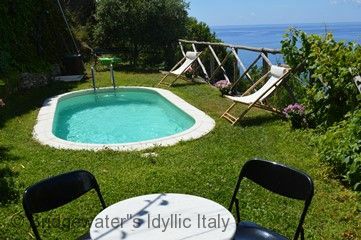 It provides extensive views overlooking the azure Mediterranean sea and the whole arch of the Amalfi Coast up to the characteristic cape of Conca dei Marini which divides Amalfi from Praiano and Positano. 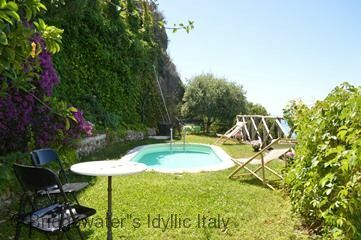 The swimming pool area is equipped with sun loungers and an external shower. 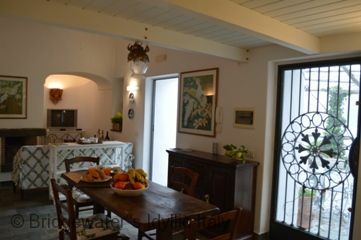 From the main terrace of the villa two glass doors give access to a charming living room with kitchen area. 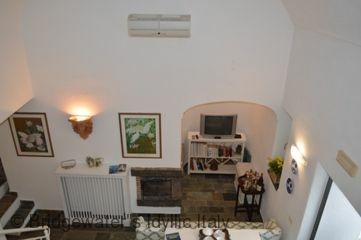 The living room features a comfortable couch, a corner fireplace, Tv and air conditioning/heating unit. 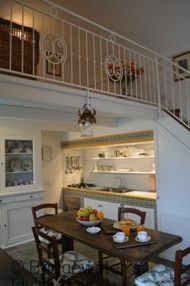 On the opposite side is found a set of antique drawers, a large white sideboard, a refectory table sitting 4 people and the well appointed built-in kitchenette decorated with typical ceramic tiles. 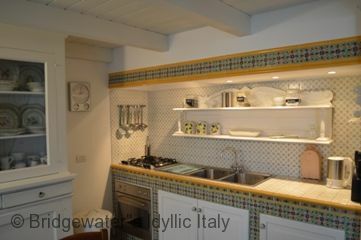 The kitchen is equipped with a four-burner gas cooker, an electric oven, a refrigerator with freezer, a microwave oven, an Italian-style coffee-maker, an American-style coffee-maker, a toaster and other small appliances. 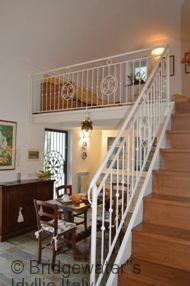 A further sitting area, located on a mezzanine level, is reached by climbing 10 wooden steps. 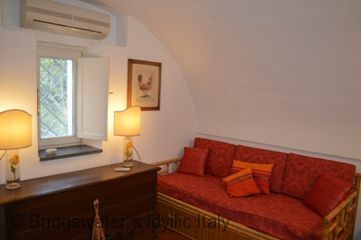 This area hosts a comfortable wicker sofa and an armchair. 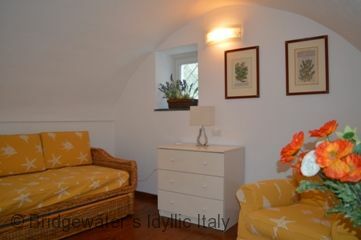 From the living room guests can access the two bedrooms which arelocated on different levels. 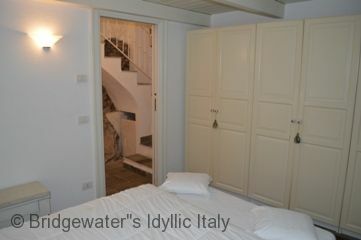 The master bedroom is reached by walking down 4 stone steps. 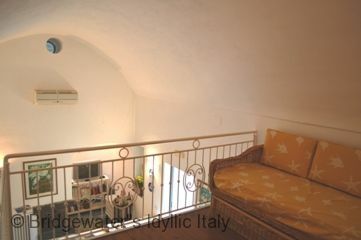 This room also has access onto the backyard terrace through a glass door. 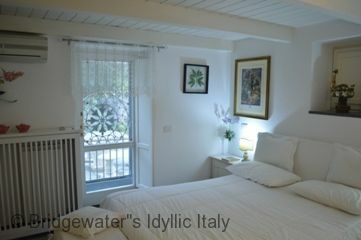 The room features a double bed, a spacious wardrobe, 2 bedside tables and an air conditioning/heating unit. 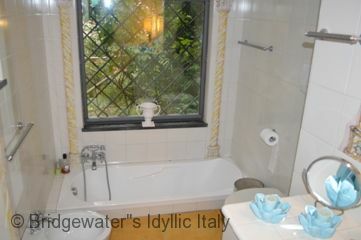 Adjacent to the main bedroom is a fully equipped bathroom. 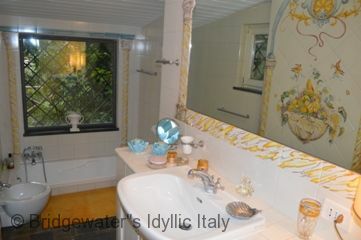 It is adorned with beautiful majolica tiles; it has a washbasin, a toilet, a bidet, two windows (the largest one facing the backyard) and a bath tub. 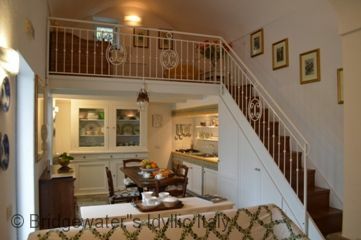 The twin bedroom, decorated with a barrel vault and parquet floor, is reached by climbing 8 stone steps. 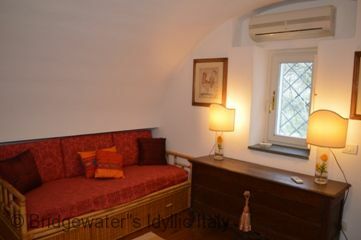 It features 2 single divan beds (cannot be converted to a double bed), an air conditioning/heating unit, an antique drawer and a window facing the backyard. 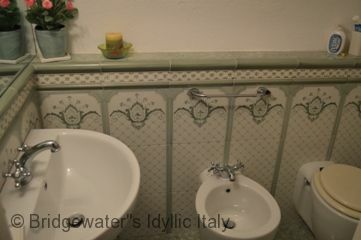 Adjacent to the twin bedroom there is a small bathroom equipped with toilet and washbasin. 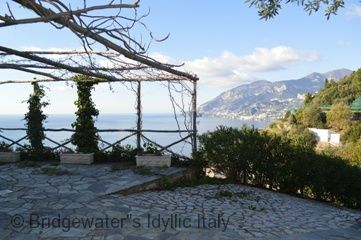 The two terraces, one facing the sea and the sun and one on the backyard, are adorned with colourful roses and flowering bourganvilleas. The main terrace is shaded by American ivy pergolas. 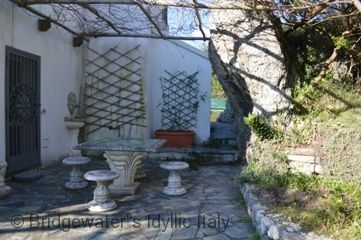 Both terraces are equipped with outside furniture; stone benches and dining tables sitting 4 people. 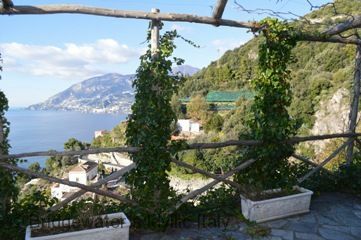 There are unfenced terraces and drops at the property and so children under 10 years of age are not permitted at this property. 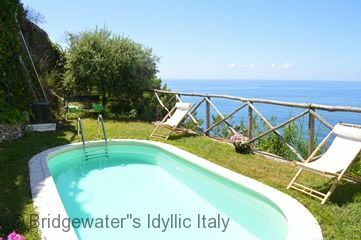 Pool (open from 01/05 to 31/10), air conditioning, winter heating, mosquito screens in every room, iron and ironing board, TV, washing machine, four-burner cooker, porter service available, microwave, Wi-Fi, refrigerator, toaster, kettle, hair dryer, private parking for one car. Mandatory cleaning fee payable locally 80 EUR per week. Maid service: on request on confirmation of booking, payable locally. Approximately 15 Euros per hour. 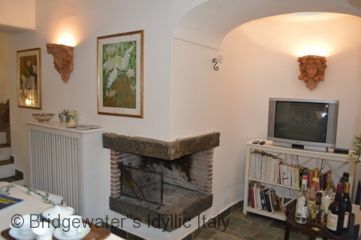 Electricity and air conditioning/heating is included in the rental price. 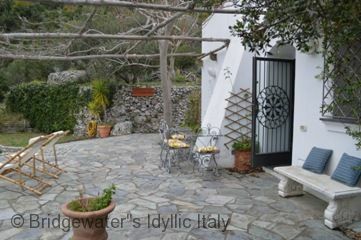 From the private parking lot you have to walk 30 metres along the main coastal road to reach the main gate of the villa. From the main gate a short uphill pathway of 200 metres (broken up by 25 steps) takes you up to main terrace in front of the villa. 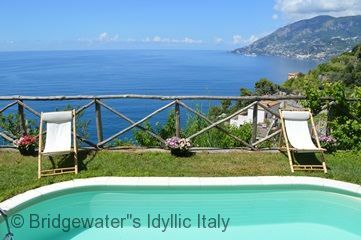 The village of Maiori and some of the Coast's best beaches are only 10 minutes away. Maiori offers all basic facilities: beach service, grocery shops, banks, post office, bars, restaurants, tourist port and further facilities. . The Sita bus stops within 30 metres of the property's main gate as well. 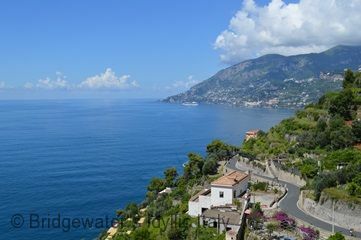 Buses run almost every hour to Salerno and Amalfi direction, making it easy and convenient to visit all the tourist areas that the Amalfi Coast offers. Refundable damage deposit due locally in cash: €300. The security deposit will be returned to you prior to your departure less any charges for accidental damages to the property. 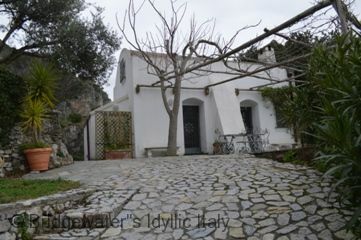 From Maiori a short boat trip (June–September) will take guests to Amalfi tourist port. 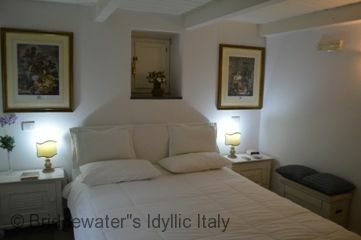 From Amalfi boats and hydrofoils to Capri (1½ h.), Positano (30 min. ), Naples ( 2 h .) and Salerno (1 h.) run from May-October.